A recent consumer reporting agency conducted an investigation into ground turkey products and the results are concerning. According to Consumer Reports, disease-causing organisms were found in many of the samples it looked at. In all, 257 samples of ground turkey were run through laboratory tests, with 60% containing bacteria. What’s even more potentially alarming about these dangerous bacteria is that a large number were found to be resistant to at least three common antibiotic drugs. Why does the ground turkey you buy at the grocery store contain antibiotic-resistant bacteria? It is now common animal husbandry practice to feed poultry and livestock antibiotic-spiked food. That in itself is bad enough, but these animals are fed antibiotics every day of their lives. Even humans, ever quick to grab a dose of antibiotics to treat an infection, would never take antibiotics every day for months and years on end. Just like humans have been urged to curb their use of antibiotics unless there’s a health crisis that will specifically benefit from a course of these drugs, health officials are demanding that livestock not be over-dosed on the drugs as well. Consumer Reports conducted their study on raw ground turkey meat and patties purchased at major grocery stores. They searched for signs of five bacteria in the meat samples: enterococcus, Escherichia coli (E. coli), staphylococcus aureus, salmonella, and campylobacter. In all but 10% of the meat samples, one or more of these five bacteria showed up in lab tests. About 60% of the samples harbored E. coli, while 69% showed signs of enterococcus. Three samples contained methicillin-resistant staphylococcus aurens (MRSA) and another 12 contained salmonella. Of the salmonella-contaminated meat, around 60% were multi-drug resistant. These bacteria are usually killed through cooking, however, though there are toxins that may remain that can still cause you harm. When cooking ground turkey, make sure to cook the meat thoroughly at moderate to high heat (at least 165 degrees Fahrenheit). 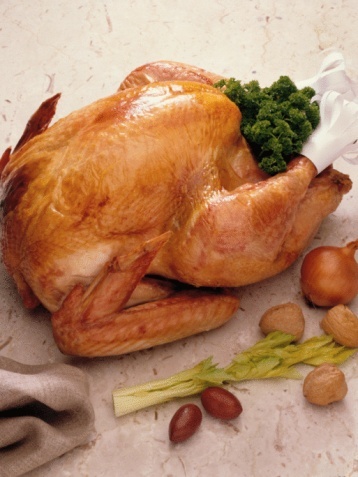 Buy fresh turkey meat and consume within one or two days. Freeze the meat if you are not going to be cooking it right away. Refrigerate leftovers within two hours of cooking. Wash your hands and all plates and utensils that come into contact with raw turkey meat, with hot water and soap. When buying turkey products at the grocery store, opt for organic turkey, turkey raised without the use of antibiotics or products labeled “USDA Process Verified.” Other healthier labels to watch out for include “certified humane,” and “animal welfare approved.” These two labels mean that antibiotics were only given to sick animals that could benefit from the drugs. Don’t fall into the trap of buying a “natural” turkey product, thinking that no antibiotics were used in the raising of the animal. The word “natural” is not regulated by any government body and the use of antibiotic-laced feed isn’t prohibited. Calls for the prohibition of antibiotics in animals raised for human consumption have gone largely unheeded by government agencies such as the Food and Drug Administration. The FDA has so far left it up to the food industry to choose not to use antibiotics. “Antibiotic Resistant Bacteria More Common on Conventional Ground Turkey Then Organic,” Mother Earth News web site, June 18, 2013; http://www.motherearthnews.com/natural-health/antibiotic-resistant-bacteria-ground-turkey-zwfz1306zkin.aspx?PageId=2#ArticleContent, last accessed Oct. 3, 2013. “Improper use of antibiotics kills thousands and harms millions every year, CDC says,” ConsumersReports.org web site, Sept. 16, 2013; http://www.consumerreports.org/cro/news/2013/09/antiibiotic-misuse-kills-thousands-harms-millions/index.htm, last accessed Oct. 4, 2013.